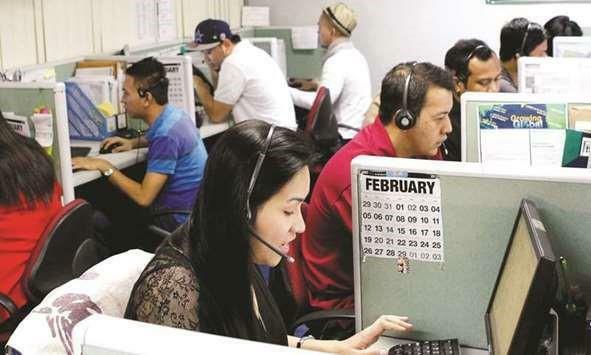 (MENAFN - Gulf Times) Sara Prestoza has worked as a call centre employee in the Philippines for 12 years, a country where several corporations such as Comcast, AT & T, and Verizon outsource their customer service and technical support services, relying on a cheap labour source of its 1.3mn call centre workers. Starting salary in some regions of the Philippines is as low as 5,000 pesos a month, equal to $92.70. The average pay is around 13,000 to 15,000 pesos a month ($240 to $270) for call centre workers, with companies often setting salary and incentive caps to prevent wages from increasing. And the better you get at your job, the more likely you are to lose it. Prestoza explained employees will be hired for one position, like technical support, but then given additional duties in customer service, billing and sales, all of which come with hourly quotas each employee must make to keep their job. The quotas are part of these companies' employee development plans. The quota for transactions or productivity will be steadily increased by employers until the worker can no longer make quota and gets terminated as a result. By firing workers on a regular basis, the outsourcing companies are able to replace them with even cheaper labour, while the worker has to find a job at another call centre where they start over at entry level wages. As a result, the new call centre receives an entry-level employee with the training and experience of a senior employee. 'We understand the business, and why they started in the Philippines, but we did not expect the exploitation, said Prestoza, who is also president of the Unified Employees of Alorica (UEA), the only union of call centre employees in the Philippines.We have no choice but to accept additional jobs without additional pay because we are already in the company and we'll be terminated otherwise. Rico Hababag, secretary general of an independent network of call centre employees in the Philippines, BPO Industries Employees Network ( BIEN ), called the employee development plan 'an industry-wide attrition mechanism. 'It's a great injustice for an employer to say that the agent is not performing. That's how the business process outsourcing (BPO) industry works here, they systematically terminate employees, said Hababag. Judith Mallari Moral, a UEA representative and technical support representative at the Exportbank Makati call centre in the Manila Metro area, explained the high employee attrition and turnover rates are a symptom of tight competition among outsourcing companies to get foreign clients.The clients will set quota metric standards, and the BPO company will raise metrics to show they can provide better services at cheaper costs, she said.The whole industry is in a race to the bottom on wages. In March 2015, California -based Alorica, one of the largest outsourcing providers in the world, purchased the company that owned the call centre site at Exportbank Makati, where Mallari Moral and Prestoza work.The site's biggest client is Comcast — which accounts for about 70% of the centre's calls, according to the union president. The centre employs around 35,000 workers. 'The Filipino workers in this industry are being drained so BPO companies extract more profit from them. So there's a need for us to unionize because there's no other way to fight back, said Mallari Moral. Workers began organising at call centres around the time that Alorica purchased the call centre. By June 2015, a group of workers had successfully registered as the first union in the business outsourcing provider industry in the Philippines. 'We started a union because of the changes and lack of transparency from management, Prestoza said. 'Even though we are using our voices to provide service in the call centre industry, we feel we have been put on mute, we are voiceless.On September 7, the Unified Employees of Alorica filed a petition with the government to go on strike arguing Alorica had refused to recognise and bargain with the union. Since the industry's first union was organised, Alorica management has refused to acknowledge its existence except for its persistent challenges to decertify the union. During the past several months, 135 union members or officers have also been fired or forced to resign. Alorica also recently pressed for criminal charges against two union officers for causing 'alarms and scandals and 12 other individuals involved with the union for 'malicious mischief, citing a September 2018 protest. The demands of the union's push to strike include an end to a recent disciplinary policy that penalises employees for being late or absent — even in cases where doctor's notes are provided to justify absences — and an end to alleged union-busting and wrongful termination of union employees. 'Since we've done everything to get their attention, we have no other choice (than) to go on strike, said Prestoza. 'We are going through the validation process with the government so we can do it as soon as possible. She noted in the meantime, the union is working on replenishing its membership of 1,500 workers as Alorica has tried to transfer union member employees to weaken the union. Alorica and Comcast declined to comment for this story.